Here are a few of the most Frequently Asked Questions that may help you find an answer. Location. Where is the campsite ? 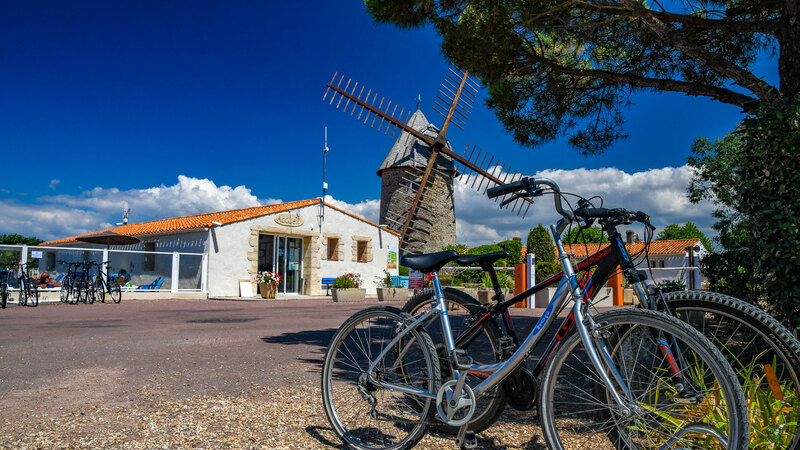 Le Moulin de la Salle Caravan and Camping Park is located on the French Atlantic coast, in Les Sables d’Olonne, south Nantes, one of the Western biggest city of France. When the campsite is open ? Le Moulin de la Salle is open from April 14th to September 21st. How long is the city centre of les Sables d’Olonne ? All the conveniences and the city centre of les Sables d’Olonne are barely 2 miles from the campsite. A Where is the nearest train station? And how long is it from the campsite ? The nearest train station is at les Sables d’Olonne city centre, 2miles from the campsite, a 7-minute-drive. Can we park several cars in my parcel ? You can park ONLY one car –City Council decree. If you have a second car, you can leave it in one of our two car parks outside the campsite, free of charge. Can I bring my pet on holiday ? Pets are welcome with an extra-charge but subject to conditions. In France, some breeds of dogs are classified as dangerous and not allowed in hotels/campsites. For more information, click here. Dogs should have their vaccination schedule up to date (vaccinate for rabies). Dogs should be on a lead at all times. ONE PET PER CABIN. We are coming with a car plus a small trailer or a motorcycle. Is this possible ? All our parcels can accommodate ONE vehicle. If you intend to come with a small trailer or a motorcycle as well there is no extra-charge. However, you may have to park your car in one of our two car parks outside since the parcel may not be big enough. What is your noise policy ? We ask for quiet between 22:30 and 8:00. Please respect other campers who may be trying to sleep. We are a family site and will not tolerate anti-social behaviour or language. Anyone causing a disturbance will be asked to leave and no refund will be given. Can we have visitors to stay with us during our holiday ? Yes, you are welcome to have visitors to stay with you so long as the pitch or holiday home occupancy levels are not exceeded. You or your visitors will need to pay any additional fees on arrival, cars may need to be parked off-site if they cannot be accommodated on your pitch. When is the pool complex open? The heated covered pool is open from April to September. The outside pool complex and the water slides are open from mid-May (depending on the weather conditions) to mid-September. Complex heated. Is the pool complex lifeguarded ? The water park is lifeguarded ONLY July and August. However, a responsible adult over 18 must accompany children at all times. Only classic lycra swimming trunks are allowed in the pool complex. Our standard arrival time is at 2pm. Departure time is before midday. Outside bank holiday weekends and school holidays (July and August) we are very flexible on arrival/departure times. How many people can we have on one pitch ? How big are your pitches ? Shady or sunny pitches, you can choose pitches from 80m2 to 100m2. Please let us know the dimensions of your unit when booking so that we can ensure a suitably sized pitch is reserved for you. Do we have electric hook up ? Yes, all our pitches have access to power supply nearby. However, some pitches need a forty-meter extension cable. What kind of electric adapter do I need to camp ? You need an European hook-up adapter with one male and one female fitting. You will plug the male socket in the campsite electricity supply. The female socket will be used to plug in your extension cable. Do we have water fountains in our pitch ? Most water fountains are close to the pitches. Are the pitches delimited ? Yes, all our pitches are delimited by native hedgerows. Do you allow BBQs onsite ? Only electric and gas BBQs are allowed on the parcels. However, if you are a charcoal “aficionado”, we have a communal BBQ area available for use. Do you have refrigerators for hire ? Yes, we have table-top refrigerators for hire. Please advise us at time of booking if you require one for the duration of your stay as all items are subject to availability and limited in stock. Can we receive DTT onsite ? Yes, you will need an aerial and a TV. We do not have TVs for hire. Is there the possibility to choose our pitch ? You have the possibility to make specific requests. We’ll try and accommodate your requests if availability allows. In any case, no guarantee can be given. Can I have a refund if I decided to leave early ? No, sorry but we do not offer refunds if you leave before the end of your booking. Yes we do offer seasonal pitches on our touring and camping park. More information can be found by clicking here. Our standard arrival time is at 3pm. Departure time is before 10am. For a BANK HOLIDAY WEEKEND you can check in before midday and check out before 5pm. Please note that the Reception desk is closed between 12:30 and 2pm. Does the accommodation have pots/pans and crockery, etc ? Do I need to take my own bed linen and towels with me ? Yes, bed linen and towels are not provided. However, all our accommodation provides pillows and duvet covers. Also, bring your own soap, towels and other bathroom and kitchen necessities. Can I request to be allocated to a specific area of the park ? Take a look in our type of accommodation and choose the one that suits you best by clicking here. Which size bed sheets do I need to bring ? Can we pitch a small tent in our holiday home parcel ? If the parcel is big enough and if the number of people does not exceed the total holiday home capacity, you can install a small tent for one or two people. However, you might have to park your car outside the park. How many toilet/shower blocks do you have ? For the comfort of all our visitors, two shower/toilet blocks are at your disposal from April to September. The number of toilet/shower cabins put into service depends on the park occupancy rate. All showers and toilets are cleaned up and inspected regularly in the off-season and several times a day during the peak season. They are equipped with washing up sinks, laundry tubs, hot showers, wash basins, WC for adults and children, baby changing areas, showers and WC’s for disabled guests. Is the park security guarded ? We have a security guard during the main school holidays, July and August. When the bar, the takeaway restaurant and the small grocery shop are open ? The bar, the takeaway restaurant and the small grocery shop open ONLY during the main school holidays, July and August. The bar and the grocery shop are open from 8am to midnight and the takeaway restaurant EVERYDAY but Monday, midday and evening. The bar and the takeaway restaurant open also during some bank holiday weekends, Ascension and Whitsunday, with limited opening hours. Do you offer activities all year round ? Daily activities and evening entertainment are organized ONLY during the main school holidays (July &August) We are a family-friendly park and we offer a range of family entertainment. You will receive an entertainment guide when you arrive on park. Is there a children’s play area ? Le bar ouvre uniquement en juillet et août de 8h à minuit. Il est aussi ouvert pendant le week-end de l’Ascension et le week-end de la Pentecôte, horaires réduits. Proposez-vous des animations en toute saison ? Yes, there is a children’s play area onsite where you can play games with your little ones and make wonderful memories. Do you have bike for hire ? Yes, there is bike hire available onsite giving you the ideal opportunity to explore the local areas. Do you have a laundry ? Yes, there is a laundry with 3 washing machines, one tumble dryer and ironing facilities. The machines are coin-operated, tokens and washing powder are available at the Reception desk and clothes airers are provided at your holiday home. Do your parks offer Wi-Fi internet access ? Yes, you have one free Wi-Fi internet access within the main park venue. Wi-Fi is also available within the accommodations with a supplement. Can I hire cots and high chairs ? Cots and highchairs are available for hire. Please, advise us at time of booking if you require one for the duration of your stay as all items are subject to availability and limited in stock.